Federal government agencies, departments and critical infrastructure are frequent targets in today’s advanced attacks. Whether the goal is to compromise sensitive government data, steal personally identifiable information (PII) or disrupt normal operations, the increasing sophistication of attacks is making it more difficult to safeguard the Federal government’s cyber critical infrastructure. To ensure the nation’s safety and protection of vital information, the leadership in the White House, Congress and Department of Homeland Security have worked together to develop security mandates and regulations designed to secure agencies from both internal and external threats. Privileged account protection and threat detection are at the center of many of these requirements due to their powerful role in providing access to critical cyber infrastructure and sensitive information. The CyberArk Privileged Account Security single-platform solution is uniquely positioned to help Federal agencies meet today’s challenging security and compliance requirements. The CyberArk Privileged Account Security solution has been added to the U.S. Department of Defense (DoD) Unified Capabilities Approved Products List (UC APL). This designation identifies products that have undergone a rigorous testing process conducted by the DoD, which assures acceptable levels of information assurance (IA) and interoperability (IO) capabilities. CyberArk’s Privileged Account Security Solution has been independently validated and awarded an Evaluation Assurance Level (EAL) 2+ under the Common Criteria Recognition Agreement (CCRA). Additionally CyberArk has received the U.S. Army Certificate of Networthiness (CoN) enabling the streamlined implementation of the CyberArk solution on the Army Enterprise Architecture/LandWarNet (LWN). Visit the Army CoN website for more details on the CyberArk certification #201621511 (requires CAC for access). CyberArk’s efforts to obtain and maintain these certifications demonstrates the company’s commitment to helping Federal organizations and global enterprises secure privileged accounts. 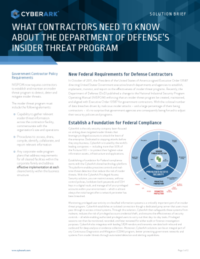 CyberArk’s solution helps federal agencies comply with requirements related to the “Access Control”, “Audit and Accountability” and “Identification and Authentication” control families. Phase 2 of the Continuous Diagnostics and Mitigation (CDM) program is focused on least privilege, a core component of CyberArk’s Privileged Account Security Solution. Requirements related to privileged access control, remote access management and access revocation in the regulation can be addressed using CyberArk’s Solution.